2. Good chef avoids soya sauce, only salt to taste. 注意: 她加太多盐, 不健康 ! She added too much salt, on top of the salty dark soy sauce ! Watch this professional 黄金蛋炒饭 Golden Egg Fried Rice demo by the 3-times Taiwanese President Chef Ah-Kee-Shi 阿基师 : he hand-mixed egg yolk (蛋黄) evenly into the over-nite cooked rice before frying. The secret is the protein from the egg yolk absorbes the water from the rice, wraps each rice grain to form golden color. With high heat, rice will not stick in the wok. 2. 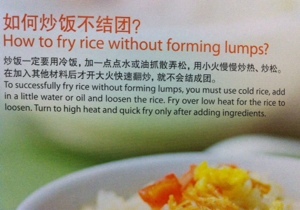 Fry too long – the rice will be too dried and hard (no moisture). French Chicken in Cream Sauce "Mère Blanc"